Chinese Herbal Skin Treatment works because it does what conventional dermatology fails to do: treat the skin INTERNALLY, at the root. Let's have a look at how I carry out the assessment and treatment of chronic skin diseases in my Herbal Skin Clinic. 1. First, I take a very close look at your skin disease. (Ever notice that conventional dermatologists barely bother to glance at it?) This is very important, as it provides the first clue to what is happening inside. The first thing I look for is how red the skin is, or not. The more red = the more inflamed = the more severe. This tells me how strong and "cooling" the herbal formula needs to be. 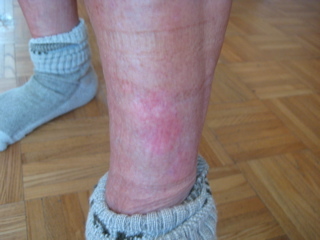 Look at the photos below to see how different 3 cases of the same skin disease (psoriasis) on the leg can look. These differences are very important to the treatment, and this applies to any skin condition such as eczema, fungus, hives, rosacea, acne, etc. 2. Secondly, I need to see if it is wet or dry. Skin diseases can ooze pus or liquid, or they can be extremely dry. This is crucial, because it tells me whether to include drying or moistening herbs, and whether there may also be infection. 3. The location of the lesions is important. Believe it or not, Chinese herbs can target a particular area of the body, to make the prescription optimally effective. There are lower body herbs, upper body herb, hand and foot herbs and face herbs. 4. 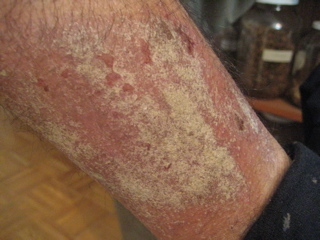 I ask about other symptoms which may aggravate the skin problem. Examples are poor digestion, constipation, sweating, insomnia, menstrual irregularity, etc. These must be treated at the same time so that they do not continue to contribute to the skin disease. 5. Finally, I look at the tongue. This is extremely important. It allows us to literally see "inside the flesh," as it were, because the tongue is the only exposed muscle in the body. It also gives us valuable information about how well the digestive system is working. Tongue diagnosis is an advanced art in Traditional Chinese Medicine. I look at the colour, coating, size and moisture. For example, if the tongue coating is very thick and slimy, digestion is poor. Armed with all of this information, it is time to compose the herbal formula. As you see, these are not herbal pills or drops, because that would not be strong enough. Anyone suffering from skin diseases knows how stubborn they can be. We need the highest dosage in order to subdue the inflammation, toxins, and severity of most skin conditions. So we use the traditional herbal preparations - a boiled herbal soup of roots, barks, leaves etc. 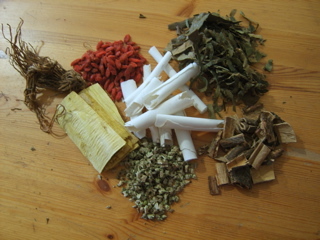 - that have ensured Chinese medicine's reliable results for thousands of years. These herbs are strongly cooling, anti-inflammatory, detoxifying, cleansing, itch-stopping and anti-allergic. Some may be thought of as "herbal anti-histamines." After one week to 10 days, we meet again. We look at the photos taken at the first appointment, and see what has changed. Is there less redness, less itch, less discomfort? Depending on the answers, and the look of the tongue, the herbal formula might be modified a little, or it may be left the same. Follow-ups continue every 2 -3 weeks until the problem is cured. Chinese Herbal Skin Treatment works on many other less common skin conditions as well, such as lichen simplex, lichen planus, perioral dermatitis, seborrheic dermatitis and more. They key to all of them is to treat from the inside.